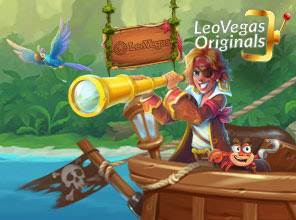 Although it's Halloween this week, LeoVegas online casino decided to do a less scary promotion and give their players the chance to win a trip to the Caribbean and other cool prizes. There are two trips up for grabs and also cash prizes. The promotion runs from the 22nd of October 12:00 to the 25th of November 2018 23:59 CET. To take part in the promotion, you'll need to opt-in to take part in promotions. There are four parts to this promotion. 1. For the raffle tot he cruise win you'll need to collect tickets. You get 1 ticket for every cumulative €100 staked in the games of the promotional category. You can collect up to 40 tickets per day. The winner is drawn at random on the 26th of November. The cruise is a 7-day rip in the Caribbean for 2 people, including flights. 2. You can also win €500 with the daily free spin on Monday and Wednesday for the slots Pirates Charm and Spinions Beach Party. If you get the highest single coin win you'll get €500 as a prize. 3. There are missions on Tuesday and Thursday for the slots Golden Fish Tank and Pirates: Smugglers Paradise. The 50 players who fulfilled the missions with the least amount of rounds will get 50 extra spins for Pirates: Smugglers Paradise. 4. You can win a share of €16.000 on the weekend, every Saturday and Sunday. There are four tournaments each day with a €2K prize pool. The offer is valid for players from the UK, New Zealand, Sweden, Germany, Norway, Denmark, Finland, Austria, Switzerland, Ireland and Canada. The full terms of the promotion can be found here. Take a Look at this Fantastic LeoVegas Promotion! The online casino LeoVegas is one of the best websites where you can find some interesting promotions. Fully optimised for mobile play, even with a dedicated app, the operator offers a great game selection along with some great bonuses. All there is to know is available in our LeoVegas review, or you can take a look at the FAQ for more information.